Last week, as British Vogue turned 100 years old, the magazine’s Editor-in-Chief, Alexandra Shulman and Genesis publisher Nicholas Roylance presented Vogue – Voice of a Century to Central Saint Martins University of Arts London. 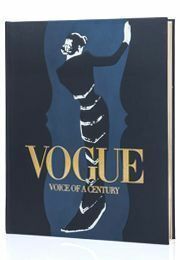 Vogue – Voice of a Century is traditionally bound to last a lifetime. Featuring words of over 100 contributors, and the imagery of 120 photographers and illustrators, it is hoped that the book will be an inspiration for Fashion students in the decades to come. To find out more about Vogue – Voice of a Century and order your signed copy, click here.